I've never tried rhubarb and raspberries together. Why? I don't know, but for some reason the idea popped into my head the other day - probably because I was thinking about what I have in my freezer and need to start using. So I went looking for a 'raspberry rhubarb dessert' and this is what I found. 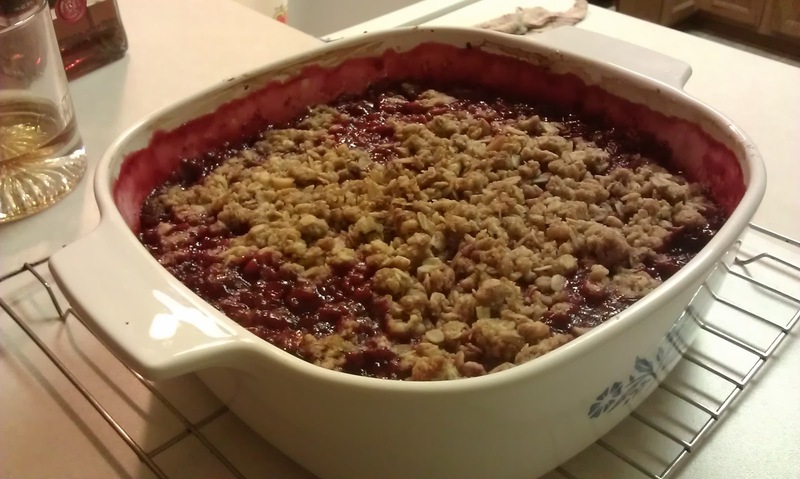 In a shallow 2- to 3-quart baking dish, combine rhubarb, raspberries, granulated sugar, and cornstarch and mix gently to coat. In a large bowl, mix oats, flour, nuts, brown sugar, cinnamon, ginger, and salt. With your fingers or a pastry blender, rub or cut butter into oat mixture until coarse crumbs form. Sprinkle evenly over rhubarb and raspberry mixture. 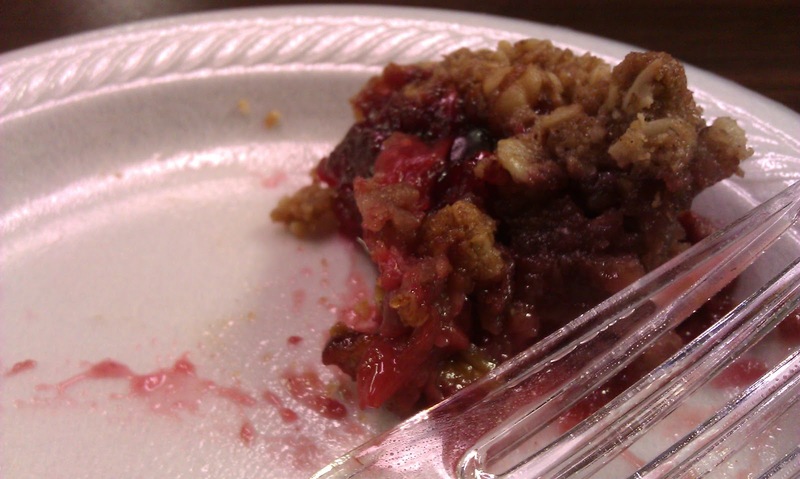 Bake in a 350° regular oven until topping is golden brown and fruit is bubbling, about 45 minutes. As noted, I used frozen rhubarb and raspberries, mostly thawed and undrained, but this would of course be great with fresh fruit, too. I only used half the raspberries the original recipe called for and cut the sugar in the fruit down from 3/4 cup to 1/2 cup because I want to taste the tartness of the rhubarb. I think it turned out great. A nice dollop of vanilla ice cream would be great on top, but it was yummy just by itself. Rhubarb and raspberries go very well together.